Employers have bought their employees Apple Macs for years. However, historically, these were few and far between, and mostly found in the hands of graphic artists and marketing departments. Is Apple’s PC share higher among employees in smaller or large companies? Among employees in smaller and medium-size companies, Apple’s share is twice that of employees in large companies. Only 1 in 11 Primary Work PCs are Apple for employees in organizations with 1,000 or more employees. For employees in companies with less than 100 employees, 1 in 5 uses a Mac. Among only notebook PCs, Apple has a substantially higher share, similarly stronger in smaller than larger companies. The move to mobility has favored Apple in recent years, as Apple’s advanced notebooks have gained broader acceptance among employers. Many other related answers are part of the full TUP service, available to paid subscribers. The TUP chapter with the most information about Hearables users is the TUP 2016 Devices Chapter. Other TUP chapters detail iPhones, iPads, and the overall brand footprint. Some industries tend to be the first to adopt new information technology, while others tend to be laggards. Others leapfrog over each other, coordinating massive efforts to get current and compliant with the latest technology, only to have it outpace their initiatives. One telling measure is the version of Operating Systems on employee’s Work PC. Nearly three-quarters (73%) of employees in Government are using PCs with Windows 8 or older. This ranks Government as last. 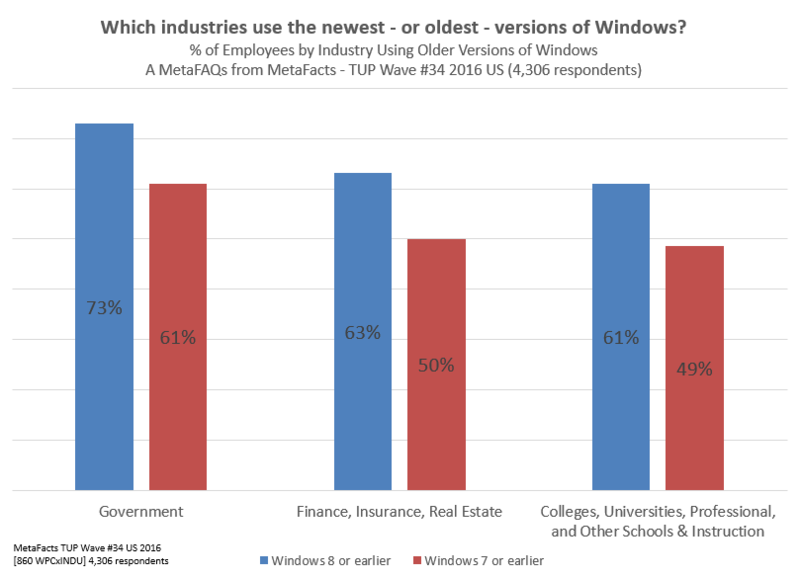 Furthermore, nearly two-thirds (63%) of Government employee’s computers are using Windows 7 or older. The 2nd and 3rd-ranked industries as OS Laggards are Finance, Insurance, Real Estate and Higher Education. In the decades of our research, we’ve seen that some industries perennially behave different than others, specifically Government and Education. These have their own seasons when they are are buying and when they aren’t. Also, these particular industry often have a more centralized approach to acquiring and managing tech products and services than many other industries. Also, higher educational institutions in the public eye have a fiduciary responsibility to the public that encourages transparent cost-justification and longer life cycles. Other industries often invest in the newest technology as a competitive advantage. We don’t expect any industry to change overnight due to release of technology. Inertia itself doesn’t change quickly. Instead, we expect technology companies such as Microsoft to continue adapting their vertically-focused efforts to help guide these industries into the future. In addition to profiling the operating systems and PCs of employees, many other related answers are part of the TUP service, available to paid subscribers. One section of TUP 2016 which includes extensive results about printers, printer users, and printing activities – the TUP 2016 Printers chapter. This is one of more than a dozen chapters in the entire TUP 2016 study. These MetaFAQs are brought to you by MetaFacts, based on research results from the most-recent wave of Technology User Profile (TUP). Employers vary considerably in how quickly they adopt new operating systems for their employee’s computers. 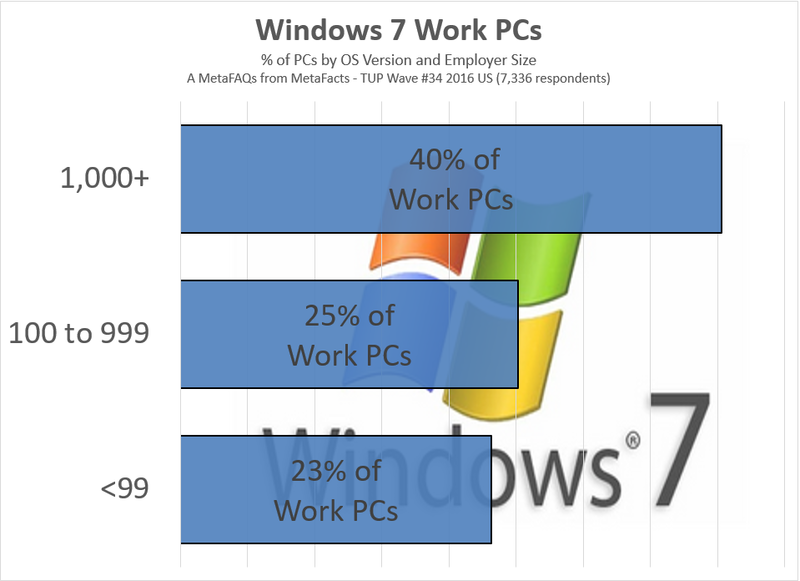 With Microsoft’s massive efforts to upgrade their installed base to Windows 10, which employees are using Windows 7? Four in ten (40%) of employees working for employers with 1,000 or more employees are using Windows 7. By comparison, the more-nimble smaller and medium-size organizations only have one-fourth of their PC-using employees with Windows 7. Larger organizations have consistently been laggards in adopting new information technology products of nearly all kinds. There are many good justifications, from spending controls, security concerns, or training issues. Often, organizations of all sizes have specific in-house or custom applications that needs to work flawlessly on newer operating systems. Looking deeper into our TUP research results, we’ve found several notable industries which are further along in moving beyond Windows 7 and adopting Windows 10 or even moving to Apple Macs.These pioneers are finding ways to use newer technology for their competitive advantage. We expect larger organizations as a whole to continue with their careful, if slower, adoption of newest technology. 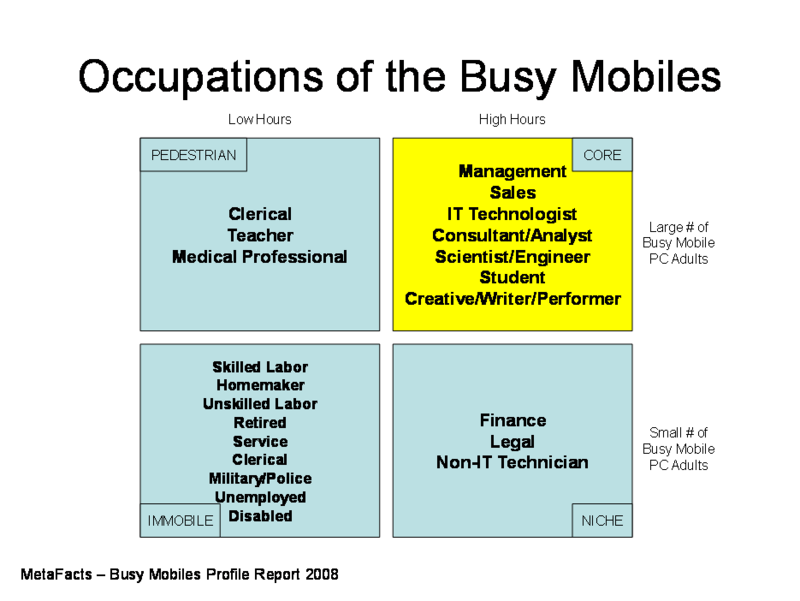 In addition to profiling the spending, demographics, activities, and devices of these employees, many other related answers are part of the TUP service, available to paid subscribers.One section of TUP 2016 in particular includes extensive results about employees and the technology they use – the TUP 2016 Work/Self-Employed PCs section. This is part of the TUP 2016 PC Chapter, one of more than a dozen chapters in the entire TUP 2016 study.